Cooliris, leader in immersive media experiences and creator of the Android Gallery application, today expands the universe of photos and gives users the best experience to browse through all their photos in one iPad and iPhone app. The new release of the Cooliris mobile app turns on endless discovery of friends? and followers? photos, and adds Dropbox to the portfolio of media sources users can seamlessly explore from the app. Cooliris is a beautiful, modern way to browse photos from various sources all in one place, and selectively share them in private groups. Cooliris has already integrated the mobile library, Facebook, Instagram, Flickr, Google+/Picasa, Twitter, SmugMug, Google Drive, Google Images, Yandex.Fotki in Russia, and Renren in China. Cooliris, which has reached the #1 iPad app in 75 countries for Lifestyle, has seen rapid user growth with over three million installs and over one billion photos connected. ?Pixels are the new decibels,? said Soujanya Bhumkar, Cooliris CEO and co-founder. ?The visual communication that Cooliris enables unifies media libraries with social conversations. This creates an engaging experience for users to connect, discover and selectively share photos the way they want, from any source of their choice.? The new Cooliris release brings deeper integration with friends? 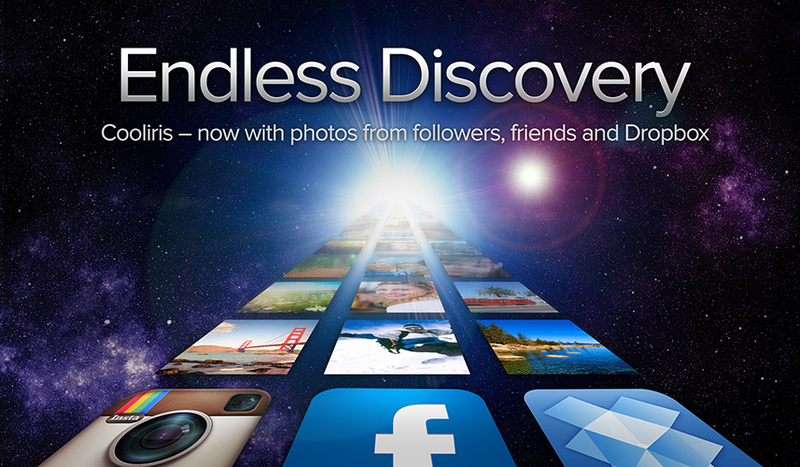 photos for enriched, meaningful social discovery. Facebook friends? photos, Instagram follower and following photos, Flickr contacts? photos, and Renren friends? photos are all now surfaced in the app for a stunning, comprehensive experience. 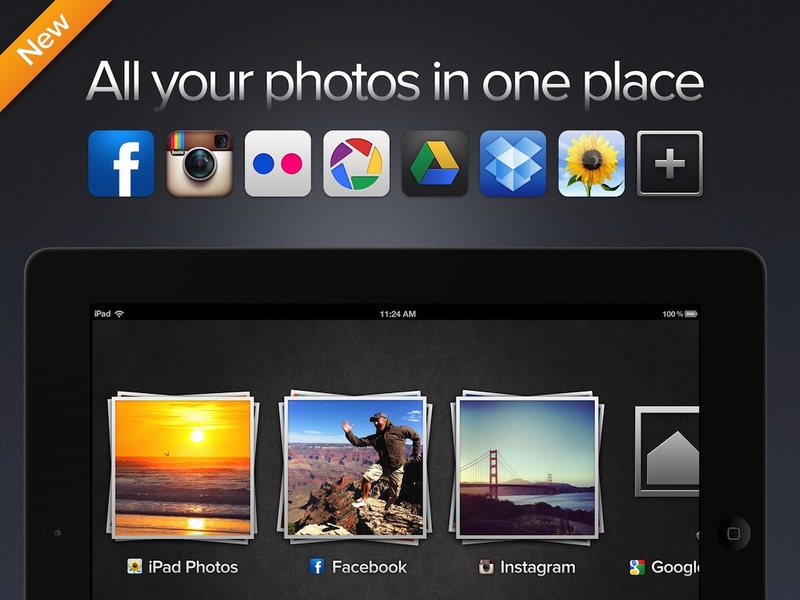 Now users can truly see all of their photos in one place ? whether it is their own photos or photos from their friends, followers, and so on. In addition, the new release seamlessly integrates Dropbox and Google Drive with folder navigation, creating an elegant, media-centric experience for viewing and sharing cloud photos on mobile phones and tablets. Users can also now ?bulk save? photos from any other source, whether it?s the mobile camera roll, social library, etc., directly into a specific folder in Google Drive or Dropbox, creating a fast and easy way to organize and save photo collections from your mobile devices. The new version of the Cooliris app is available for free on iPad and iPhone in the iTunes App Store. Cooliris is the leader in creating the world?s most immersive and media-centric experiences for mobile and web consumers. The successful adoption of the Android Gallery app boosted Cooliris into comScore?s top 10 smartphone properties and top 10 most used mobile apps in the U.S. Cooliris has now launched an all-out focused effort to creatively disrupt the modern photo experience by building a brand new experience for photo creation, curation and consumption. The team of 14 collaborators is located in Palo Alto with presence in Berlin, Singapore and Taipei. Cooliris is venture backed by Kleiner Perkins Caufield & Byers, DAG Ventures, The Westly Group, T-Venture, and DOCOMO Capital. For more information, visit www.cooliris.com.